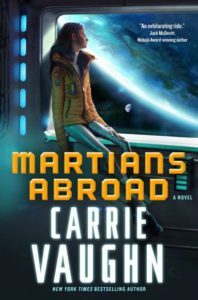 I don’t think Martians Abroad is coming out for a couple of weeks, but I was delighted to receive a review copy from Tor a couple of days ago since I’ve enjoyed most of Carrie Vaughn’s work that I’ve read. Polly Newton has had her life planned out for a while now – intern at the astrodome on her native Mars, and eventually get into a starship piloting program. When her mother arranges for her and her brother Charles to attend the prestigious Galileo Academy on Earth, her whole life gets derailed. Life at the academy doesn’t exactly turn out to be what she expected either. Books set at schools are always a little more fun because of the setting, and Martians Abroad is no exception. There’s something intrinsically compelling about reading about your protagonist getting used to a new place and new people. Polly is a pretty typical teenager – confused but completely certain she knows best, stubborn, and rebellious. But when things get hairy, she does the right thing, and everyone likes her for it, including me. Her difficulties fitting in are exacerbated by her reaction to Earth. Vaughn did a great job of conveying how alien a planet like Earth would be to someone who grew up on a naturally uninhabitable planet. The other characters don’t stand out that much, except for Charles, who I really wanted to know more about. I’d say the biggest flaw with this book was the plot. I couldn’t believe that the antagonist would get away with the things they did so easily. I feel like it also made Polly’s growth arc too contrived, it felt like she was constantly reacting rather than growing on her own. Maybe I would have felt differently if the book hadn’t ended so soon; it ended just as things were getting interesting. I hope there will be a sequel because I would like to follow up with what happens to Polly and Charles. This entry was posted in Books, Reviews and tagged fiction, science fiction, young adult by Kriti Godey. Bookmark the permalink.